Nobody visits my blog for recipes. That’s not a complaint — it’s just a statement. I’m a passable cook and have never poisoned anybody, but sharing recipes here just isn’t my thing. My son Domer was home for the holidays, and I enlisted his help in preparing something I’d been hungering for for a long time. Now don’t turn your noses up like I did when new college friends down South tried to tell me about it. I don’t eat insects, I think I told them. But this pie doesn’t contain a single grasshopper! Crush 22 Oreo cookies, give or take, and set a tablespoon or so aside. To the rest, add 2T. of melted butter and press into a pie pan. Place 1/2 C. milk into saucepan and heat on low to medium. Dissolve 24 large marshmallows into it, stirring often, and cool. Stir in 4T Crème de menthe. Fold in half the contents of an 8 oz. Cool Whip container. Pour into pie shell. Top with remaining Cool Whip and sprinkle on those previously set-aside cookie crumbs. This entry was posted in Uncategorized and tagged Crème de menthe, French Quarter, grasshopper pie, New Orleans, recipe. Bookmark the permalink. Grasshopper pie is wonderful. Grasshoppers-the-drinks weren’t so bad either, although I preferred White Russians. Oh, the 1950s and 1960s — they just came back in a rush! I’ll bet whipping cream would taste better, Linda. We didn’t have any, but we always keep Cool Whip (I don’t even want to know what’s inside it!). I’m glad I was able to coax some wonderful memories for you. 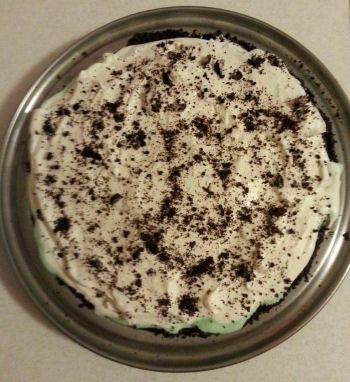 I was a freshman in college when I first encountered Grasshopper Pie and fell instantly in love with it! I don’t make it near often enough, ha. Oh my stars, my Mom use to make this for dessert when we had company. And a Grasshopper was the first cocktail I ever had at about the age of 5. A taste. It was so good. And Cool Whip brings back such memories. Sneaking a spoon full from the tub in the freezer and the next thing I knew it was gone, and my name was being shouted with frustration the next time my Sweet Mom went to use. I still love Cool Whip…. I happen to like Cool Whip, too, Kb. I know it’s not the same thing as whipped cream, but the lazy part of me appreciates it. Why, even Dallas likes Cool Whip, and he looks so cute with a dollop of it on his nose! I seem to remember “drinking” a concoction of Crème de menthe and vanilla ice cream that was beyond awesome! “I don’t eat insects, I think I told them. HAHAHAHAHA! Debbie, this pie looks and sounds absolutely delicious! I love all the ingredients. And it reminds me somewhat of a frozen yogurt pie I used to make while I was living in Florida. It contained two cups of flavored yogurt mixed with Cool Whip and then sprinkled with cookie crumbs of your choice. It was heavenly! Thanks for sharing this recipe, my friend! Happy Sunday! Your frozen yogurt pie sounds delightful, Ron. If you find the recipe, I’d be glad to try making it. I love that you can customize it to your heart’s content, too! You know, it didn’t help that my friends tried convincing me this pie was full of bugs — and the sprinkled dark cookies on top were actually dirt, ha!! I’m all about simple recipes, and this one sounds amazing! Thank you for sharing it, Debbie. I will definitely be giving this one a try the next time I’m called on to make a dessert. YUM YUM! Golly, thank you, Terri! I hope it turns out for you — and that your family (or co-workers) enjoy. I love that it’s so easy, yet looks rather elegant. And I’m not sure about the calorie count, but who eats desserts worrying about that, huh?! Well heck that looks yummy. I think it is a keeper for sure! Thanks, Beth Ann. I totally agree! And best of all, it’s so EASY! I would definitely have a piece of Grasshopper pie! Haha. Well…if there were bugs…I’d still have a piece. Maybe. No bugs, honest. It really is good — I wouldn’t lie! I’m coming over with a spoon! Domer…watch out I may take your bedroom. Dallas, you have a new sister. Plus, I love to cook…bake and feed people, so a bonus for both of you, Debbie. Yum! Audrey, I bet we’d get along famously! You might have to “fight” Domer for the kitchen when he comes home to visit, but Dallas would LOVE a new playmate — and I’d love your company. When you’re in my area, give me a call! Sorry Debbie, even though I love oreos, you lost me on this one because when I saw the photo I kept imagining those crumbled cookies were bugs in pie. That was exactly my problem, Pat! It didn’t help that my friends TOLD me there were bugs inside, either. Only after I saw a cut slice and the creamy greenness inside did I get up enough courage to sample — and I’m sooo glad I did! You had me at Oreos, but really- why Grasshopper pie? That really doesn’t sound appealing! The “grasshopper” part is named after a cocktail that used Crème de menthe to make it green (and give it a minty kick). I agree, the name doesn’t make it sound too appealing, though! Wow Deb….a recipe blog. You go girl! Are you the new Paula Dean? LOL! Martha Stewart? Maybe I’ll have to try a recipe…..Maybe dragonfly stew…LOL! Don’t expect putting recipes here to become my thing, Tanya! I just wanted to share something delicious with my circle of friends. Nobody’s gonna call me Paula Dean, not the way that woman adds two sticks of butter to EVERYTHING, ha! !